Passive Sentence | What Is a Passive Sentence? Nowadays, black kites are protected. Anita was driven to the theatre by Carla. Nowadays, black kites are protected by law. 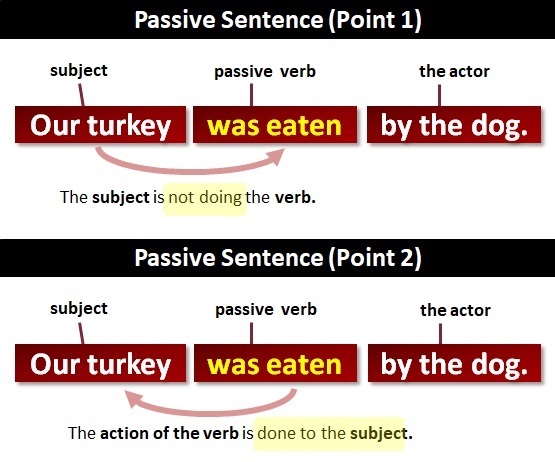 The opposite of a passive sentence is an active sentence, in which the subject does perform the action of the verb. My cousin tackled the shoplifter. Carl sounded the alarm in a panic. Carl sounded the alarm due to the panic. Many companies do not like their staff to write using passive sentences. Therefore, a number of grammar checkers will often suggest an active version of your passive sentence. However, if you prefer the passive version, stick with it. Passive sentences are quite useful if you're trying not to apportion blame. The document had been released into the public domain. Jackie released the document into the public domain. A serious failing in standing operating procedures had occurred. Pistachio nuts are grown in Iran. His parade uniform was stolen. English and German are spoken in many Cornish campsites. An estimated 258,000 people were injured in alcohol-related crashes. Martin crashed into the barrier and was tossed in the crowd.